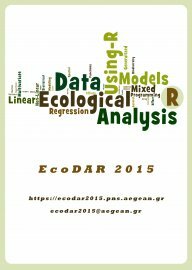 The School of Environment of the University of the Aegean and the Institute of Marine Biology, Biotechnology and Aquaculture of the Hellenic Centre of Marine Research co-organize for the third consecutive year, EcoDAR2015, an International Summer School in Ecological Data Analysis at Mytilene, Lesvos Island, Greece. This year, drawing on the experience of the very successful EcoDAR2013 tha was organized in Mytilene (https://summer-schools.aegean.gr/ecodar2013), and EcoDAR2014 that was organized in Heraklion, Crete (https://summer-schools.aegean.gr/ecodar2014), it aims to highlight the importance of the quantitative approach to the interpretation of the complexity of natural systems and in solving ecological problems. The Summer School would be appealing to advanced undergraduate, postgraduate, Ph.D. students and researchers in Ecology. A wide range of classical and modern statistical techniques will be presented and applied to contemporary environmental issues. The data analysis tool that will be employed will be the widespread and constantly evolving programming language R. Lectures will be accompanied by practical sessions to help participants to gain a better feeling of the software. This initiative will bring together internationally renowned scientists in the analysis of ecological data and mathematical ecology, to teach this subject. The tuition fee is €300. The number of participants is limited to 30 people. The Summer School is held under the auspices of the Hellenic Ecological Society.